Some people may not realize it, but Do Not Forsake Me Oh My Darling is just Sophia Cacciola rocking the drums and singing while I play bass. When people hear our record, they often ask me if I played the guitar or if someone else was uncredited as there is no listing for guitar. For those of you who have seen us live, you are probably aware that there is no guitar! We keep our recordings relatively true to our live sound and don’t do any bass/guitar overdubs. So, the kids wonder, how do I get that sound? …and why? Sophia and I used to play in a band called Blitzkriegbliss. The band was a trio. She played guitar and sang. I played bass. We played with some great drummers, but we seemed to shed them faster than dirty socks. So, after some frustration keeping the momentum going, Sophia decided to learn the drums. After a short time working on that, we decide to get things going again. I suggested that I could mess around with some kind of hybrid guitar/bass situation so we didn’t need another member. At first I thought I’d play guitar and octave it down, but I kind of felt like that had been done a lot before. Also, one of my favorite things about our previous work was that I could do my best to channel some of the great bass approaches used by Peter Hook of Joy Division and New Order – probably my favorite bass player. I wanted to continue down that path. I really wanted to avoid using samplers, backing tracks, and shoegaze pedal stomping. I just wanted a sound that I could keep pretty constant throughout – sort of like a classic genre sound (but a new one) that didn’t rely on a million combinations of processors. So, I bought an octave pedal from my favorite effects pedal company ElectroHarmonix and decided to give it a go. After some quick messing around, we decided it worked! Here’s what I came up with. Oh, and before we get into the details, I am probably the least gearheady person in the world. I don’t think too much about this stuff at all. Half of the time, I can’t even remember the brands I am using. 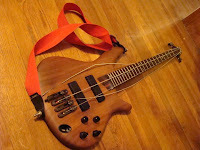 It all begins with an Ibanez SoundGear SR3000 bass. I am sure the very specific particulars of the instrument do have an effect on the sound, but I think the key component is that it has an active pickup and can output a pretty strong signal. I put this instrument through quite rough treatment. Here is a photo of it after I broke two strings during a song live recently (link to video). I use the simplest splitter (multipurpose even) in the world, a BOSS chromatic tuner. I take the output channel and send it directly to my bass amplifier and take the bypass channel and send it to the remainder of my “guitar” rig. Stomping this pedal (turning the tuner on) then shuts off the signal to the bass side of the rig, but not the guitar side. I’d have to work really hard to find a less fancy bass rig than I’ve got. 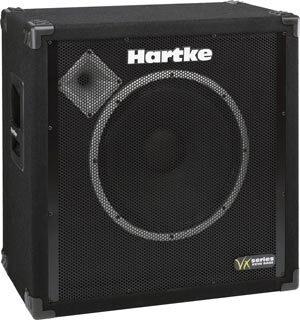 I use a Hartke HA3500 amplifier head with a 115 cabinet . I like the amp’s blend of tube and solid state channels (I mostly crank the tube channel). I rarely use the amp’s EQ and I never use the compression. I’ve always used cheap, get-the-job-done type cabinets. I got a Hartke VX115 because it was light and the 15-inch speaker gives me great low end. 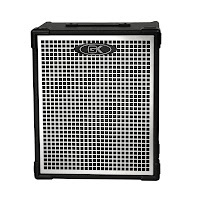 As I am sending a lot of mid and high signal to the guitar rig, I didn’t really care too much about a cabinet with much of anything other than low end. Main criteria: cheap, not too heavy, and not too big. 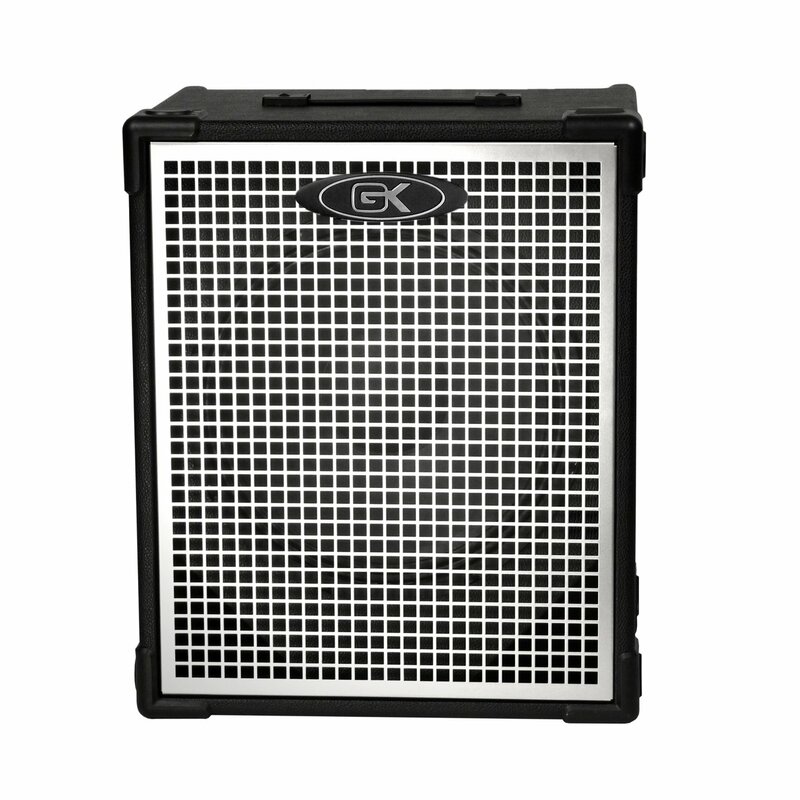 More recently, I switched to the Gallien-Krueger 115MBE 1×15 Ultra Light Bass Speaker Cabinet. It’s smaller, lighter, can handle more power, and, at least to my ears, sounds better. All-in-all, it’s a win! That’s it for the bass side of my setup! The guitar side is a little more involved, but not too crazy. I did everything I could to keep it simple. I start things off with what I consider to be my secret weapon! The Rusty Box is a boutique bass pre-amp pedal designed to help replicate the bass tone of Bob Weston (Shellac). I love the pedal because it gives me a little extra control of how hard I am driving subsequent stages of my rig. The thing that is tricky with this guitar path is that it’s all about gain staging and balancing things just right. The Rusty Box is a great initial aid and I use it just a little bit to help me get more control of changes in tone associated with how hard I attack the strings of the bass. I can go from pretty clean to total noise dirt depending on my strike. This little guy contributes quite a lot to that! Here’s a little image showing my starting knob positions for getting myself set up. Yes, I drew those knob positions myself, thanks very much! This brings us to the obvious necessary transformation that brings the bass into the guitar’s tonal range. The ElectroHarmonix Polyphonic Octave Generator is my weapon of choice. I use it to shift the bass signal up both one and two octaves, with very little clean signal passed and no suboctave. I detune the shifted sounds a little to add some dissonance and fear to the sound. The use of the two octaves makes the bass sound a little bit more like an organ than a guitar, but that kind of works for me. It also results in changes in dissonance depending on how hard the strings are struck. If I give the strings a good whack, lots of dissonance. If I play gently, a fairly consonant signal. The image to the left shows my initial settings for this pedal (marked with red tape, some of which is coming off or has come off). From there, I send the signal to a volume pedal. I use an Ernie Ball Volume Pedal Jr. to control the level of the “guitar” half of the rig. This gives me the ability to play with full guitar, partial guitar, or no guitar (just bass!). 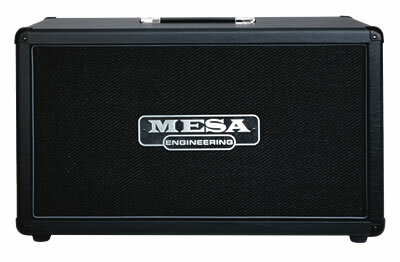 Finally, I send the signal to a Mesa Single Rectifier amplifier and Mesa 212 cabinet. I use the clean channel, but I push the gain up really high (so it’s not actually so clean). Depending on how the tubes and pedals are feeling that day (and how much I’ve messed up tiny settings in this highly non-linear system), I sometimes have to crank the mids. I also sometimes have to drop the mids! Sometimes in the studio, we have also taken the signal from the POG stage of the system while tracking and reamped it using software amplifier simulators to enhance the sound, particularly the low mids, which can sometimes be cranky and unpredictable. That’s it! Let me know if you have any questions about it! Next PostMichael J. Epstein Memorial Librarian Tanya Palit moonlights…as a muffin!